Yoga is a unique way to raise funds. Its a fun way of sending extremely strong and positive vibes out into the universe. The first time I attended Yoga For Hope in 2013, I experienced an amazing feeling of unity, caring, and positivity. If you live in the areas of San Diego, San Francisco, or Seattle and you love yoga I strongly encourage you to seek out this event and give it a try. You will not regret it I’m pretty sure. Proceeds of this event go towards research at City of Hope. City of Hope is a leading research and treatment center for cancer, diabetes and other life-threatening diseases. Designated as a comprehensive cancer center, the highest recognition bestowed by the National Cancer Institute, City of Hope is also a founding member of the National Comprehensive Cancer Network, with research and treatment protocols that advance care throughout the nation. City of Hope’s main hospital is located in Duarte, Calif., just northeast of Los Angeles, with community clinics in southern California. 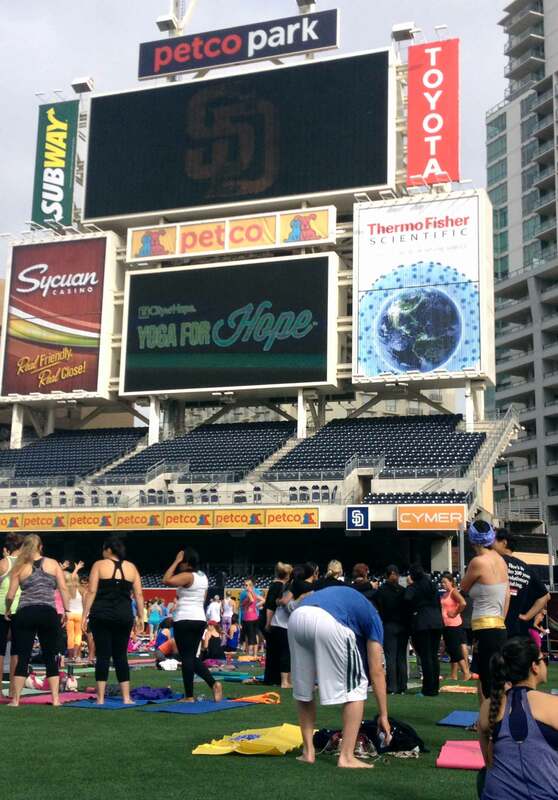 This year the San Diego event takes place on Saturday, June 13th, 2015 on the center field of Petco Park home of the SD Padres. It is so exciting to walk out onto the baseball field! The yoga starts at 8:30am and lasts about 2 hours. There are usually 4 guest yoga guides who will lead us through a series of flows which are geared for yogis of all levels. Prior to the yoga there are some introductory speeches which tell us about the work being done at City of Hope. They also tell us how restorative yoga is used as part of patient care and how beneficial it has been for patients and their recovery. Finally, there is also a a ringing of the bells ceremony which is truly something to experience. Petco Park, San Diego, CA. If you are looking for a new yoga experience I encourage you to visit the Yoga for Hope website and sign up to attend. Alternatively, it would be really awesome if you wanted to help by sponsoring me. I feel truly blessed that I will return to San Diego this June and participate in something which is truly inspirational and contributes to the greater good. To your health and Namaste.